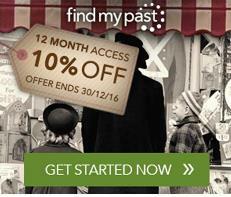 FindMyPast is offering a 10% discount on its 12-month World subscription. Could be just what you're looking for to get your New Year resolution – the one about making some serious progress with your family history – off to a great start. To take advanatage of the offer, click on the currency you want to pay in below. The offer will run only until 23.59 GMT, Saturday 31 December 2016, so don't miss out. Irish Newspaper Archive is offering some big festive savings on access to its 9-million-page database. For a 30% discount on the price of an annual subscription, which will reduce the cost from €178 to €124.60 – a very useful €63.50 saving – use the code XMAS30. 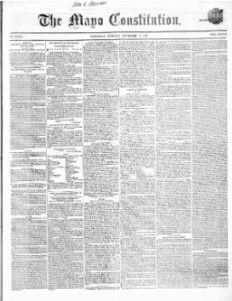 The Dublin-based and family-owned Irish Newspaper Archive holds 60 historical national, regional and local publications, many of them not online elsewhere. The discounts will expire on Thursday 29 December. The Public Record Office of Northern Ireland: PRONI will be closed from Monday 26 December to Wednesday 28 December inclusive. Open Thursday 29 and Friday 30 December. Closed Monday 2 January 2017. General Register Office of Northern Ireland: GRONI will be closed Friday 23 December to Wednesday 28 December inclusive. Open Thursday 29 and Friday 30 December. Closed Monday 2 January 2017. Reopening on Tuesday 3 January. Presbyterian Historical Society Library: The Library and Archive will be closed from Wednesday 21 December 2016 until Tuesday 3 January 2017. National Library Reading Rooms: All NLI reading rooms will be closed from Saturday 24 December to Monday 2 January 2017 inclusive. Normal hours from Tuesday 3 January. National Library Exhibitions: Exhibitions will be closed from Saturday 24 December to Tuesday 27 December inclusive; They will open from 10amd to 4:45pm from Wednesday 28 December to Friday 30 December inclusive. They will be closed from Saturday 31 December to Monday 2 January inclusive. Normal hours from Tuesday 3 January. National Archives of Ireland: The Reading Room will close at 12:30pm on Friday 23 December and re-open at 9:15am on Wednesday 28 December. Normal hours Thursday and Friday 29 and 30 December. It will be closed Monday 2 January and will re-open at 9:15am on Tuesday 3 January. RCB Library: The Representative Church Body Library and Archive will close at 4pm on Friday 23 December and re-open at 9:30am on Tuesday 3 January 2017. Dublin City Public Libraries: All Dublin City Public Libraries will be closed from Saturday 24 December to Monday 2 January 2017 inclusive. They will all re-open to normal hours on Tuesday 3 January. The National Archives, Kew: TNA will be closed from Saturday 24 December to Wednesday 28 December inclusive. It will be open Thursday 29 and Friday 30 December. It will be closed on Monday 2 January 2017. Society of Genealogists: The SOG will close at 6pm on Thursday 22 December and re-open on Wednesday 28 December. It will be open on Thursday 29 December for one day only, closing at 6pm. It remain closed for annual stocktaking until Tuesday 10 January 2017. Irish Genealogical Research Society Library: Based at the Society of Genealogists, and open on Saturday afternoons, the IGRS Library will not open on the following dates: 24 and 31 December and 7 January 2017. Back to normal routine on Saturday 14 January. Troy Irish Genealogy Society in New York has added another very useful database to its free website. This time it's the Lot Sale Book records of St Agnes Cemetery, Menands, New York. The new collection covers lot purchases in St Agnes from 1867 to 1922 and lists 6,063 names. In addition to names, the details transcribed from the fragile book may include certificate number of purchase and date, date of deed to lot, purchase price, lot number, plot number and square feet of lot. This 108-acre cemetery was open to Catholics, so the records don't include only Irish immigrants, even if they do appear to be the majority, based on the names, especially in the early days. The Society points out that many of the lot purchasers were joint purchases by individuals with different surnames, which may indicate a family relationship. With these additions, RootsIreland's Sligo database spans across 16 civil registration districts. You can see the full details of the holding, which also includes Roman Catholic, Church of Ireland, Methodist and Presbyterian records, on the Sligo Sources page. Tipperary Studies, the website of Tipperary Libraries' Local Studies department in Thurles, has launched the second phase of its Digitisation Project (the first phase was in May - see blogpost). Digitisation has been carried over the last several months and has resulted in a wonderful package of graveyard inscriptions covering no less than 62 burial grounds in North Tipperary and the parishes of Killenaule and Moyglass. These are now available as a library of downloadable parish-by-parish pdfs (most of them seem to be 1.5 to 4Mb). 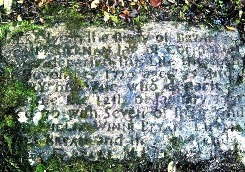 You can find the menu on the Tipperary Studies 'Gravestone Inscriptions' page. The volunteers at the Registry of Deeds Index Project have managed to get in another update before the end of the year. It means there are now 221,907 entries transcribed from 25,211 memorials of deeds available to search, free of charge on the website. 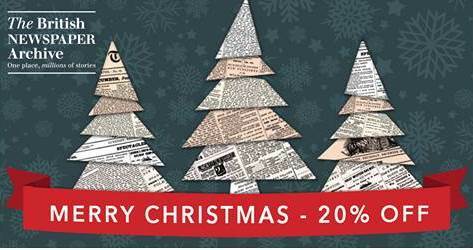 The British Newspaper Archive (BNA) is offering a 20% discount on its annual subscription. 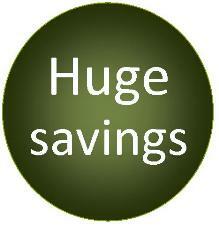 The offer reduces the cost of the 12-month 'unlimited' package from £79.95 to £63.96. The BNA now holds more than 17.5million newspaper pages across 708 titles. Of these, 129 are from Ireland; they include both national and local papers including the Irish Times, Belfast Newsletter, Cork Examiner, Tralee Chronicle and the Carlow Post and some produced for a specialised readership such as The Dublin Builder and the Catholic Telegraph. 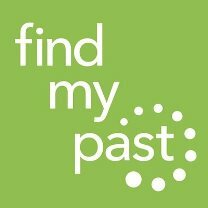 All of these titles are included in a FindMyPast Ireland or World subscription, but it you're not currently head down on genealogy research, you might find a standalone BNA subscription suits you better. In which case, to take advantage of the offer, click the image below and type XMAS16 into the promotion code box. You'll see the subscription rate alter to £5.33 a month. Please note that this discounted annual subscription requires an up-front payment; it is not available monthly. The discount offer will expire on 28 December. Volunteers, both new and old hands, have been busy in the last two weeks contributing and transcribing records and photos to deliver a bumper update to Ireland Genealogy Projects Archives. All the records in the IGP Archives are free to access. As it's the season of goodwill... if you're considering giving a donation to a worthwhile cause, why not make a cash contribution to IGP-web? While the records and photos and transcriptions are given freely by volunteers, maintaining an ever-growing photo-laden website costs real money. Every donation, however small, helps keeps the site online for the benefit of everyone in the Irish family history community. You can donate here. The new Statutory Rule The Public Use of the Records (Management and Fees) Rules (Northern Ireland) 2016 comes into effect at the Public Record Office of Northern Ireland (PRONI) today. It introduces a new tariff for charges for photocopying, postage, research by staff etc, and some of the increases are quite significant, so worth noting if you don't want to find yourself financially embarrassed during a visit! Access to all records online and at the Titanic Boulevard offices remains free of charge, however. Another major change will be much more welcome. It allows researchers to use their own mobile, tablet or digital camera to photograph most documents (obviously not those with specified copyright restrictions). Previously, such photography had to be agreeed in advance by the Head of Public Services. From today, as part of the document ordering process, researchers will be required to sign a copying and copyright declaration as they collect documents they wish to photograph. Taking your own images means you'll avoid the new higher charges for using PRONI's photocopiers. Monday 12 to Friday 16 December: Preservation Week at PRONI. There will be no document ordering service. Search Room and self-service microfilms will operate to normal hours. 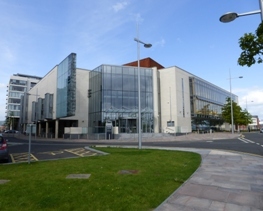 Public Record Office of Northern Ireland, Titanic Boulevard, Belfast. Tuesday 13 December: The Foundation of St Thomas's Abbey, with Marie-Therese Flanagan. Last of the Milestone of Medieval Dublin lectures 2016. Wood Quay Venue, Civic Offices, Dublin 8. Free. 1:05pm to 1:50pm. No need to book. Tuesday 13 December: The evolution of the Irish harp emblem, with Stanislav Zamyatin. Host: Genealogical Society of Ireland. Venue: Dún Laoghaire Further Education Institute, Cumberland Street, Dún Laoghaire, Co. Dublin. Donation €3. All welcome. 8pm. Tuesday 13 December: The Strange Case of Mr Thomas Meharry - A Melodrama, with Elizabeth Scott. 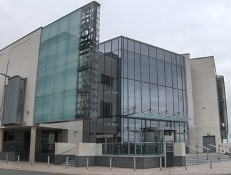 Host: North of Ireland Family History Society, Lisburn Branch. Venue: Bridge Community Centre 50 Railway Street, Lisburn, BT28 1XP. 7:30pm. All welcome. Wednesday 14 December: Victorian Malahide – Memoirs of Win McLeod, with Mary McNamara presents with music and images. Host: Malahide Historical Society. Venue: Presbyterian Church Hall, Dublin Road, Malahide, Co Dublin. 8pm. €4. Non-members welcome. Free parking in Bridge Field public car park opposite venue. Thursday 15 December: School and Education Records, with Valerie Adams. Host: North of Ireland Family History Society, North Down and Ards Branch. Venue: 1st Bangor Presbyterian Church Hall, Main Street, Bangor BT20 4AG. 7:30pm. All welcome. Thursday 15 December: Research Room open for extra hours, 10:30am to 1pm. North of Ireland Family History Society (NIFHS), Unit C4, Valley Business Centre, 67 Church Road, Newtownabbey, Co. Antrim, BT36 7LS. Thursday 15 December: The building trade in late medieval Ireland, with Dr Rachel Moss. Host: Royal Society of Antiquaries of Ireland. Venue: Helen Roe Theatre, Society House, 63 Merrion Square South, Dublin 2. 7:30pm. Monday 19 December: Genealogy information sessions, with Margaret Bonar and Elizabeth Craven. Morning and afternoon sessions. Morning venue: Raheny Library, Howth Rd, Dublin 5 from 10:30am to 11:45am. Afternoon venue: Donaghmede library, Donaghmede Shopping Centre, Dublin 13 from 2:30pm to 4pm. Free. Bookings to 085 1444883 or impossibleancestors@gmail.com. Tuesday 20 December: Peoples, Kings and Kingdoms, with Dr Patrick Gleeson. Part of the Tipperary People and Places Lecture series. Host: Tipperary Studies, Tipperary Libraries. Venue: Gallery of the Source Library, Thurles, Co Tipperary. 7:30pm. Free. All welcome. Thursday 22 December: Early closing (3:45pm) at all National Library of Ireland locations. This includes the free Genealogy Service at Kildare Street. The closure is to facilitate a staff development meeting. Now that we're comfortably into December, it's time for my annual reminder that the free Genealogy Advisory Services at the National Library and the National Archives are not at their busiest, so this could be a perfect opportunity to drop by for some specialist help with your brickwall or to ask for guidance on 'where to go next'. Mon–Wed: 9:30am–5pm; Thurs & Fri: 9:30am–4.45pm. There is no appointment system. You just turn up and wait your turn, but queues are a lot less likely in December than during the busy summer season. The New England Historic Genealogical Society (NEHGS) has announced a historic collaboration with the Roman Catholic Archdiocese of Boston, Massachusetts, to create a database of 10 million Catholic records dating from 1789 to 1900. The collection will include baptisms, marriages and burials, plus first communions, confirmations, sick calls and deaths. It will be jam-packed with Irish emigrants, as well as a huge number of Italians and Germans who collectively made Boston such a major immigration port during the 19th century. The Archdiocese of Boston is one of the largest Catholic dioceses in the United States, encompassing more than 130 communities in Massachusetts. According to the 2010 Religion Census, 45% of the state's residents consider themselves Catholic — a statistic that would shock the original, overwhelmingly Protestant, colonists. Catholicism was illegal in Massachusetts until 1780, and violent hostility still reigned in Boston decades later. The arrival of thousands of Irish Catholics fleeing the Famine horrified the resident population in the 1840s and early 1850s. In 1854, when it was estimated that one in three people living in the city was Irish-born, the Know Nothing party of bigots gained a landslide electoral victory with their slogan 'Americans must rule America' and sought to strip the new arrivals of jobs and workers' and voters' rights. Fortunately, the Know Nothings were roundly defeated two years later. On completion of this significant digitisation project, the resulting NEHGS database on AmericanAncestors.org will contain more than 10 million searchable names, making it the largest genealogical collection of American Catholic records online. The timescale for the digitisation project hasn't been revealed. UPDATE 9 January 2017: Details will be released tomorrow at 11am EST (4pm Dublin/London) at a press conference which will be streamed live through the NEHGS website at AmericanAncestors.org. Monday 5 to Friday 9 December: Reading Room closed to the public for annual media preview. National Archives of Ireland, Bishop Street, Dublin 8. Free Genealogy Service will not operate on these dates. Reopens Monday 12 December. Monday 5 December: Agnes Jones – Pioneering Nurse, with Gerald McGill. Plus Members' Research Meeting. Host: North of Ireland Family History Society, Foyle Branch. Venue: Derry Central Library, 35 Foyle Street, Londonderry, BT48 6AL. 7pm. All welcome. Tuesday 6 December: Frongoch & 1916, a series of new 1916 exhibitions – Official Launch by Catriona Crowe. Host: Digital Repository Venue: National Museum of Ireland, Decorative Arts, Collins Barracks, Benburb Street, Dublin 7. Noon. All welcome. No need to book. Wednesday 7 December: Family History Online, a workshop for beginners. Host: Libraries NI. Venue: Lisburn City Library, Linenhall St, Lisburn BT28 1FJ. 10:30am to 12:30pm and 2pm to 4pm. Free. Booking essential – T: 028 9266 9345, E: lisburncity.library@librariesni.org.uk. Thursday 8 December: WWI Ireland: Exploring the Irish Experience, an exhibition tour. Host and venue: National Library of Ireland, 2/3 Kildare Street, Dublin 2. Booking is not required. All welcome. 2pm. Thursday 8 December: Derry City Cemetery and its burial registers (newly transcribed), with the Council's Archive team. Host: Derry City and Strabane District Council. Venue: Tower Museum, Union Hall Place, Derry~Londonderry, BT48 6LU. 7:30pm. Free. All welcome. Details. Friday 9 December: Women of the Rising, with Dr Margaret Ward. Host: Enniskillen Library, Halls Lane, Enniskillen, Co Fermanagh BT74 7DR. 12:30pm. Free. All welcome.Booking advised: T 028 6632 2886 or enniskillen.library@librariesni.org.uk. Saturday 10 December: Ower the Sheugh – considering the Irish and Scottish migrations across the Narrow Sea in historical prespective, with Dr Paddy Fitzgerald. Host: North of Ireland Family History Society, Tyrone Branch. Venue: Omagh Library, Dublin Road, Omagh, BT78 1HL. 10am. All welcome. Saturday 10 December: The National Library's History & Heritage, an introduction to the Library's rich architectural history and the Signatories exhibition, plus a guided tour of the Reading Room. Venue: National Library of Ireland, Kildare Street, Dublin 2. Admission free. All welcome. 1pm. No need to book. Saturday 10 December: Finding the Source: A Survey of Irish Genealogical Websites and Databases, an intermediate level workshop with Miles Davenport. Host and venue: McClelland Irish Centre (Norton Room), 1106 North Central Avenue, Phoenix, Arizona 85004, USA. 10:30am to 1pm. Non-Members: $20/Members: $15. Need to register. Details. Sunday 11 December: Family History Fair. Venue: Great National Abbey Court Hotel, Dublin Road, Nenagh, Co. Tipperary, 11am- 4:30pm. Admission free. FindMyPast has added a collection of some 486,000 Royal Irish Constabulary Service Records dating from 1816-1922. Released in association with the National Archives, the collection includes a wide range of registers and returns including disbandment records of both British and Irish recruits, service number allocation for ranks and officers, details of the force's clerical staff, nominal rolls by county, and much more. Joining a separate collection called Royal Irish Constabulary History and Directories is a selection of publications dating from 1840 to 1925. If you have an RIC ancestor, this is where you can learn more about the day to day administration, organisation, salaries and regulations of the force. Regular readers of Irish Genealogy News will know that Ancestry recently added the Royal Irish Constabulary Pensions, 1873-1925, collection to its database, which would seem to be a good additional record set to search. Details. Seems to be a good time to have RIC ancestors! Dave Hall and IGP. Click image for larger view. The team of volunteers at Ireland Genealogy Projects Archives (IGP-web) has been very busy in the second half of November, as you can see from the number of headstone collections photographed and transcribed in the list below. The National Library of Ireland will be hosting its 8-week Introduction to Family History course from 18 January. The course, led by the well-respected tutor Sean J Murphy, will be held on Wednesday afternoons (2–4:30pm). Places will be limited to 30 participants and the course fee is €100. Participants should have some experience of using computers. Booking by email only to Ciara Kerrigan – ckerrigan@nli.ie – will open on 12 December. Do not send your booking request before that date. Preview of course; principles of history and of genealogy, recommended texts, preparing draft pedigrees; advice on completing a personal genealogical project; research methods, National Library, National Archives, General Register Office and other record repositories. Please bring available laptops, tablets, etc, for practical classwork. Computers and online resources; websites of National Library and other repositories; the e-library; Ancestral Quest and other genealogy programs, online family trees; photographs, videos and digital images. Online workshop I. Origins and forms of Irish placenames, administrative divisions; forenames or first names; origins of surnames internationally and in Ireland, surnames of Gaelic and settler origin, septs and chiefs, the question of Irish ‘clans’. Census returns of 1901 and 1911 and pre-1901 fragments, census records online; review of progress in personal genealogical projects. Civil records of births, marriages and deaths commencing in 1864 (and non-Catholic marriages commencing in 1845); Tithe Applotment Books (1820s-30s), Griffith’s Valuation (1848-64), Valuation Office records. Online workshop II. Memorial inscriptions in graveyards, churches and commercial cemeteries; an introduction to estate papers, newspapers, directories, occupational records, and other miscellaneous sources. Online workshop III. Recapitulation of main points of course, review of students’ progress, comparing portfolios, selected student case studies, planning further work. The British Newspaper Archive has added The Kerry Evening Post to its line up of Irish titles (this addition brings the total to 129). Politically conservative and pro-Union, the paper was published in Tralee twice a week from 1813. Like many other newspapers, it could not continue printing during WW1 due to paper rationing and ceased publication in 1917. So far, a selection of 902 editons published in the 1850s, 1860s and early 1870s is available in the British Newspaper Archive database, but the planned holding will eventually include the full 104 years of publication. The paper has also joined the Irish Newspaper Collection at FindMyPast. ‘Please Be Seated: The Content of Church of Ireland Pew Registers’ is the working title of the December Archive of the Month presentation from the Representative Church Body Library (RCBL). The online exhibit focuses on the relatively rare church record called the pew register, one of an array of record types produced by the parish vestry – the committee that dealt with the parish's administration and management. on 25th September 1719; RCB Library P326.28.3. The practice of purchasing, renting or being assigned with a pew was primarily found in wealthier parishes, particularly in urban areas, where parishioners were more likely to be able to afford the cost. Pews were considered as property and, as with all property, it was necessary to record the rights and transactions involving them. In many cases, the record of such transactions was simply kept in the regular vestry minute books of the parish but occasionally, particularly in well-endowed parishes with revenue to spend on dedicated volumes, a separate pew register might be kept. The new archive presentation, which has been researched and created by the RCBL's Robert Gallagher, examines the content of the pew register of St Werburgh’s in Dublin, a volume spanning the period from 1719 up to 1839 (although after 1764 entries are very cursory indeed, reflecting how the process of owning or renting a pew began to die out in the late 18th and early 19th centuries). As one of the earliest Anglo-Norman churches established within the city walls and as the parish serving Dublin Castle, St Werburgh’s enjoyed high status in the city. Its pew register gives an unusual insight into the parish’s social structure, providing glimpses of the wealth and status enjoyed by the parishioners. Owning a pew in St Werburgh’s, Dublin, was a lucrative privilege especially for a person who was able to afford one of the more expensive or well-positioned pews, in a parish whose members included the Lord Mayor of Dublin, the Lord Lieutenant of Ireland, and some of the leading businessmen in the city such as David La Touche. The volume reveals the resolutions that the vestry agreed about pew-related transactions, the income realised from the same, and the parish’s wider social structure – indicated by such details as who was sitting where – with the most sought-after pews being located either in the gallery or near the front of the church. While pew registers may be relatively rare, those that survive provide a colourful asset for researching parish history, the stories of individual parishioners, and the communities in which they lived. Five more of the lectures presented at the Genetic Genealogy Ireland (GGI) conference last month have joined the online library of videos from the two previous conferences and are now freely available to view on the GGI's YouTube channel. 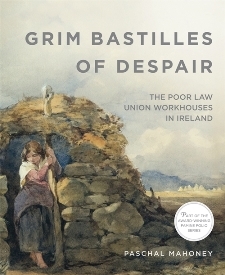 Grim Bastilles of Despair, by Paschal Mahoney, is a short study on the Poor Law Union workhouses in Ireland. It has been published by the Great Hunger Museum at Quinnipiac University in the USA as one of this year's Famine Folios, a multi-disciplinary series which presents new research in Famine studies. The folio explores how, despite strong Irish resistance, the British authorities established the 'Act for the Effectual Relief of the Destitute Poor in Ireland', which was to become one of the most despised Acts ever to come into effect in Ireland. The author, himself a Dublin-based architect, includes an account of the selection of the workhouse architect, George Wilkinson, and provides a short biography of his career, together with a detailed description of his model designs for the workhouse buildings which had been created to ensure that nothing short of total destitution would compel anyone to seek refuge there. The ideology of segregation and confinemen, as well as the traumatic daily experience of the paupers who had been forced by eviction and starvation to enter these brutal institutions, is described and illustrated with drawings and photographs. Published in softback, the 48-page study also describes the devastating impact of the Great Famine and how these flawed institutions imploded under the enormity of this great tragedy, causing almost one third of a million people to die within their grey stone walls during the Famine years of 1846-51. The Famine Folios are available through Cork University Press. Price €11.95. 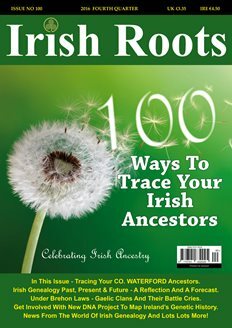 Irish Roots Magazine has just published its 100th issue – a terrific achievement for Ireland's only independent genealogy magazine, now run by Maureen and Julie Phibbs, a mother and daughter team based in County Wicklow. This quarter’s edition brings reflections and forecasts about the past, present and future of Irish genealogy, and reproduces a nostalgic feature, written by the late Tim Cadogan for the first edition of the magazine in 1992, exploring the impact on public libraries of developments then taking place in family history research. In it, he writes: "In the course of the past 20 years, genealogical research has advanced from the low-profile mildly eccentric activity of times past to a high-profile semi-commercial activity, increasingly targeted by tourism interest as another aspect of our heritage that can be exploited. I must confess to a twinge of regret at the arrival of the new and aggressive approach to genealogy." More than two decades later, such feelings are still being expressed by those of us getting a bit long in the tooth, even at we delight in the latest online releases of records that were previously difficult, inconvenient and time-consuming to access. I'm sure these conflicting sentiments will still be being discussed among genealogists in another 20-odd years! But back to the contents of the magazine... There is also a mammoth listing of 100 research tips and ideas to inspire you. It's full of research techniques, notes of record collections you may have overlooked, historical context details that may cast a new light on some aspect of your family history, and background explanations to give you a better understanding of some of the major genealogical record sets. Other research features include overviews of sources for tracing ancestors in County Waterford and New Zealand; an article explaining the Brehan Laws of Gaelic Ireland; news and views from around the industry; a review of the many record collections released online during the last quarter; letters to the editor; Q&A; and much more. Irish Roots Magazine is available in print via good newsagents, and by post or by digital format at the Irish Roots Media website. You can also download a free sample of this special edition. 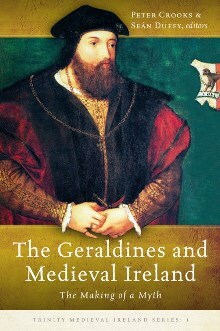 Four Courts Press has published The Geraldines and Medieval Ireland: The making of a myth. Edited by Peter Crooks and Seán Duffy, it is the inaugural volume in the Trinity Medieval Ireland Series, which arises from a symposium held three years ago to mark the 500th anniversary of the Great Earl of Kildare's death in September 1513. The 446-page illustrated hardback traces the history of the Great Earl’s family from its origins to the sixteenth century. Some of Ireland’s finest historians offer fresh appraisals of the origins of the Geraldines, their significance and reputations, and explores the reception of the ‘myth’ of the Geraldines from the sixteenth century onwards. You can see full details of the contents here. 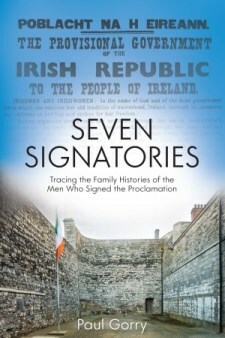 The book is now available via the publisher's online shop for €45 (catalogue Price €50). Applications are being sought for ten suitably qualified candidates, including a Chairman (m/f), to sit on the National Archives Advisory Council (NAAC). The NAAC is the board which advises the Minister for Arts, Heritage, Regional, Rural and Gaeltacht Affairs on all matters affecting archives and their use by the public. A regional spread of candidates is sought, and applications would be welcomed from those that reflect the diversity of the Irish population, particularly in gender, geography and cultural interests. Council members need to have accredited qualifications and professional experience as archivists, leadership experience as ICT specialists, or have senior professional/academic experience in related fields, one of which is genealogy. The closing date for applications is Monday 19 December 2016. UPDATE 21 December: Closing date extended to Thursday 5 January. Tuesday 29 November: Reconstructing West Clare family histories using DNA, with Paddy Waldron. Host: Kilrush & District Historical Society. Venue: Teach Ceoil, Grace Street, Kilrush, Co Clare. 8pm. New members welcome. €5 for non-members. Tuesday 29 November: Heylands & Gettys of Ballintemple & Cullyrammer, with R.W. Patterson. Host: North of Ireland Family History Society, Causeway Coast and Glens Branch. Venue: Guide Hall, Terrace Row, Coleraine, Co Londonderry. BT52 1HF. 8pm. All welcome. Tuesday 29 November: A Dominican's view from Dublin Bridge, with Bernadette Williams. Host: Milestones of Medieval Dublin lunchtime lecture series. Venue: Wood Quay Venue, Civil Offices, Wood Quay, Dublin 8. Free. 1:05pm. All welcome. Saturday 3 December: The secrets of the Bog Bodies, with Eamon P Kelly. Host & venue: Tipperary County Museum, Mick Delahunty Square, Clonmel, Co Tipperary. 10:30am. €5. All welcome. Seats allocated on a first come, first served basis. Sunday 4 December: Evensong at St Patrick’s Cathedral, Dublin. A thanksgiving service to mark the 80th Anniversary of the Irish Genealogical Research Society. 3:15pm. Details. Wednesday 7 to Friday 9 December: Reading Room closed to the public for annual media preview. National Archives of Ireland, Bishop Street, Dublin 8. Free Genealogy Service will not operate on these dates.Reopens Monday 12 December. 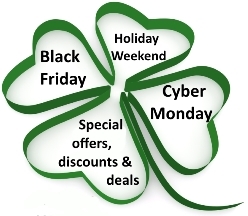 There's a selection of worthwhile Black Friday / Cyber Monday / Holiday Weekend discounts and bargains available this weekend. They include savings on DNA testing kits, subscriptions to records databases and historical newspapers, purchases of books and magazines. Most, but not all, have been reported here on Irish Genealogy News over the last week, but for convenience, I've gathered them together onto just one page on my Irish Genealogy Toolkit site. If you fancy grabbing yourself a good deal, take a look at the Special Offers page. 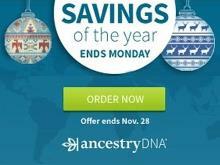 To mark the Thanksgiving-Black Friday-Cyber Monday weekend, Ancestry DNA has announced some very worthwhile discounts on its testing kits. These special offers are available in Ireland, the UK, the USA and Canada, and each of the discounts comes with a 'lowest ever' or 'lowest this year' price tag. All will be available until Monday. Ancestry.co.uk – £30 off + shipping = £49 (lowest price ever). Order before 11:59pm GMT, Monday 28 November. Ancestry.com – 30% discount = $69 + shipping. Lowest price of the year. Order before 11:59pm ET, Monday 28 November. Ancestry.ca – $50 off regular price = $79 + shipping. Order before close Monday 28 November. * I'm not absolutely sure what expiry time applies to the CA offer (I can't view the pages, thanks to Ancestry's wretched 'geo-locater', grrrr), but I expect it's just before midnight like the other two. The Dublin-based IrishNewsArchive.com has a Black Friday offer that will bring cheer to a good many researchers: one month's subscription to the entire database of 60 historical national, regional and local newspapers for just €7.50. That's a terrific saving... the regular monthly price is €30. To take advantage of the offer, click the Subscribe button and select the monthly payment button. When you get through to check out, use the coupon code: BlackFri02. The offer will be live for one day – Friday 25 November – only, so act quickly to ensure you don't miss out. 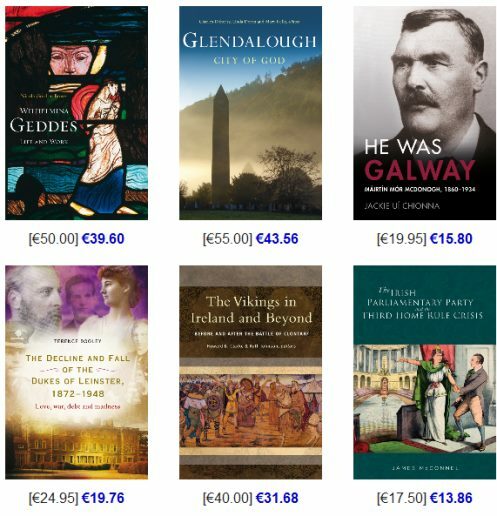 Four Courts Press, one of Ireland's leading academic book publishers, has a double discount offer on all books ordered from its website between now and midnight on Friday 25 November. When you visit the company's website you'll see a 'web' price alongside each book; while this offer runs, you'll see a second discount applied when you reach the check out page and enter the coupon code. The image below shows some indicative total price reductions on a selection of recently published titles. The coupon code is FCPFRIDAY. The Reading Room of the National Archives of Ireland (NAI) will be closed to the public from Monday 5 December until Monday 12 December to facilitate the annual media preview of archives of Government Departments. These archives will be opened to the public in January 2017. Only representatives of newspapers and broadcasting companies will be admitted during the media days. The NAI's free Genealogy Service, which is usually available Monday to Friday, 9:30 to 5pm, will not operate during this week. The latest update to the volunteer-led Registry of Deeds Index Project sees 219,838 entries in the database, transcribed from 24,978 memorials of deeds. Another refinement from earlier this month allows researchers to filter their search to the role each individual had in the memorials. For example, you can now enter 'W' in the 'Role Filled' field to view the names of people who were witnesses. See list of codes used. As always, the database is free to search explore at http://irishdeedsindex.net/search/index.php. To mark Thanksgiving, RootsIreland is offering some big savings on its annual and six-month subscription packages. The cost of a new annual subscription is reduced by a whopping one-third to €150 (saving €75), £123 (saving £62) and $170 (saving $85), while the half-year sub is reduced to €125 (saving €25), £100 (saving £38) and $149 (saving $38). These kind of discounts don't come along very often from RootsIreland, a not-for-profit company, so be sure to take advantage of them while you can. 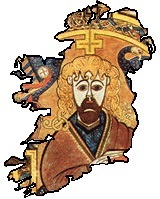 Covering almost the entire island, the database holds more than 20million transcriptions from Roman Catholic registers (most extending to 1900, at least), Church of Ireland and Presbyterian registers as well as records for some congregations of other denominations. In addition, RootsIreland now holds civil records (BMDs) into the early 20th century for half of the counties of Ireland, and a growing number of gravestone inscriptions. The offer expires at 23:59hrs GMT (Dublin time) on Tuesday 29 November. Prices for the one-month sub and 24-hour pass remain unchanged. There's a lovely free curio coming our way from Ancestry's World Archives Projects in due course: Ireland School Masters and Mistresses,1826. Currently being transcribed by volunteers, the source material is a Report from Commissioners into Education in Ireland in the stated year. The resulting index will include the name of the school master or school mistress, the name of the parish, and the name of the townland or other location of the school. 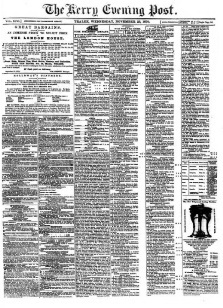 Click the image, right, for a full size view of the pages being indexed. As the transcription is being done from printed type arranged in strict format, this is an ideal project for beginner transcribers with a familiarity of Irish names and placenames. The Project was released only a couple of days ago and is already 25% through the Phase 1 keying stage. If you want to lend a hand, click the link above and become a volunteer. All World Archive Projects collections join Ancestry's database on a free to access (index-only) basis. Early Warning: The Public Record Office of Northern Ireland will be holding its annual Preservation Week from 12–16 December (inclusive). During this time, PRONI's Preservation & Collections Management staff get an opportunity to dedicate some time to the vital work that goes on behind the scenes. The knock-on effect means a reduced service to researchers. There will be no ordering of documents from the stores during the week but the Search Room and self-service microfilm facilities will be available as normal. Standard hours of opening operate (Monday to Wednesday and Friday 9am to 4:45pm; Thursday 10am to 8:45pm). Until 25 November: 150 years of the Presbyterian Children’s Society – an exhibition. Venue: PRONI, Titanic Boulevard, Belfast. Open during normal PRONI hours. Free. Details. Monday 21 November: Genealogy information sessions, with Margaret Bonar and Elizabeth Craven. Morning and afternoon sessions. Morning venue: Raheny Library, Howth Rd, Dublin 5 from 10:30am to 11:45am. Afternoon venue: Donaghmede library, Donaghmede Shopping Centre, Dublin 13 from 2:30pm to 4pm. Free. Bookings to 087 6491605 or impossibleancestors@gmail.com. Monday 21 November: Church Records, with Gillian Hunt of the Ulster Historical Foundation. Host: North of Ireland Family History Society, Larne Branch. Venue: Larne Bowling & Lawn Tennis Club, 112-120 Glenarm Road, Larne, BT40 1DZ. 7:30pm. All welcome. Monday 21 November: Using the National Library, a research workshop with Dr Emma Edwards. Host and venue: National Library of Ireland, Kildare Street, Dublin 2. 2pm. Free admission. Booking required: learning@nli.ie or 01 6030 278. Details. Tuesday 22 November: Quaker Records, with Noel Jenkins. Host: North of Ireland Family History Society, Belfast Branch. Venue: C.S. Lewis Room, Holywood Arches Library, Holywood Road, Belfast, BT4 1NT. 7:30pm. All welcome. Tuesday 22 November: Report on the newly-released Survey of Hospital Archives, with Brian Donnelly. Host and venue: National Archives of Ireland, Bishop Street, Dublin 8. Free. 6pm. All welcome. No booking required. Thursday 23 November: Book launch: Edenderry 1916 and the revolutionary era, by Ciarán Reilly. Host and venue: Edenderry Public Library, JKL St, Edenderry, Co Offaly. 7:30pm. Thursday 24 November: Merchant sailors from Glenaan to Glenarm lost in the 1st World War, with Ian Bradley. Host: North of Ireland Family History Society, Ballymena Branch. Venue: Michelin Arts Workshop, Braid Arts Centre 1-29 Bridge Street, Ballymena, BT43 5EJ. 7:15pm. All welcome. Thursday 24 November: Exhibition launch – Milestones: Birth, Marriage and Death in County Down. Host and venue: Down County Museum, The Mall, Downpatrick, Co Down BT30 6AH. Launch 7:30pm (RSVP 028 4461 5218). Saturday 26 November: Battle of the Somme Seminar, part of the Explore Your Archives Campaign 2016. Host and venue: Dublin City Library and Archive, Pearse Street, Dublin 2. 2pm–4pm in the conference room. Full programme available from cityarchives@dublincity.ie. Free. All welcome. Ireland Genealogy Projects Archives has issued a call for more volunteer headstone transcribers. The free-to-access online repository of crowdsourced Irish genealogy records and photos relies on volunteers not only to submit material but also to help prepare that material for a live, searchable environment where other researchers can find it. So, while some volunteers are tripping over the ancient remains of grave markers and getting rained on as they photograph headstone after headstone, others are needed to transcribe the names, dates and other details captured in those photographs. The transcribers don't get wet or bruised, and they can be based anywhere in the world. Christina Hunt, who co-ordinates the online archive, told Irish Genealogy News that she's often asked why IGP Archives transcribes the photographs. "Search engines can't read the headstone inscriptions in the images," she explains. "They can only read text. So we have to present them with the words and names that researchers might be searching in a text format rather than a visual format." The volunteer photographer submits the photos. Christina crops and enhances them as best she can, adding contrast to make the inscriptions stand out. She numbers each photo and then prepares a folder, ready to be sent to a transcriber. An example of a set of photos waiting to be done can be viewed here – Galway Bohermore waiting. Christina then sends a volunteer transcriber a photo set. "If a volunteer is more comfortable with more recent, easier-to-read stones, I try to give them those," she says. "If they like a challenge, I send an older set. Very quickly, though, transcribers get a feel for the kind of wording used in headstones, and this helps." The transcriber uses a text pad or Word.doc program, working from headstone image to headstone image. It helps to work with two pages open on the screen at the same time (or even to work from two open devices), but otherwise basic computer skills are all that's required. "I would say our best transcribers have some curiosity," says Christina. "If they aren't sure of a month or placename, they may do some Googling or check a death index online. On the main practicalities, when a word or line can't be read we use dots to indicate missing words, and we use pipes '|' to show a new line on the headstone." Here's a finished text file as an example: Kilkenny Bennettsbridge text. The transcriber's finalised text file is then emailed back to Christina, who adds details of both the photographer and transcriber, plus headings and links to the photo menu page before uploading the files to the IGP Archive website. If you think you could spare a bit of time for some occasional transcription work, get in touch with Christina at chrisnina@gmail.com. You'd be contributing to a great cause – one that's been helping researchers all round the globe for many years – and one that's absolutely reliant on volunteers. 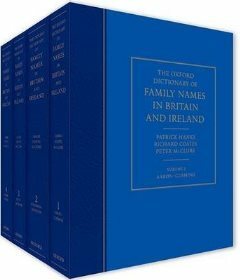 The Oxford Dictionary of Family Names in Britain and Ireland was published yesterday, with a four-volume hardback and a searchable online version (£) at OxfordReference (see below for temporary free access) providing details of the origins and geographical distribution of nearly 46,000 surnames. According to the blurb: "Much of this evidence is new, drawn from previously untapped medieval and modern sources such as tax records, church registers and census returns. Each entry contains lists of variant spellings of the name, an explanation of its origins (including the etymology), lists of early bearers showing evidence for formation and continuity from the date of formation down to the 19th century, geographical distribution, and, where relevant, genealogical and bibliographical notes, making this a fully comprehensive work on family names. About 40,000 are native to Ireland and Britain, while the remainder reflect the diverse languages and cultures of immigrants who have settled on these islands since the 16th century, including French Huguenot, Dutch, Jewish, Indian, Arabic, Korean, Japanese, Chinese and African arrivals." The study, by the University of the West of England at Bristol, took four years and explores the frequencies of each name at the time of the (UK) 1881 and 2011 censuses, the name's main geographical home hub in Britain and Ireland, its language or culture of origin, and in some cases, an explanation supported by historical evidence for the name. You can view a free sample – for the surname Hawkins – to see what the pages might reveal. For the surname Santry, there are a couple of options for English origins. I've never heard English origins suggested before, so I was curious to learn more. However, in the 'early bearers' section were individuals such as Andreas Santry (b1815 near Bristol) and Henry James Santry (b1845 in Brixton); I know them to have been the sons of Daniel and Cornelius, both born in Ireland. Cornelius, in fact, was born in Bandon. So these specimens didn't strike me as very good examples of 'English origins' for the name. The 'Irish origin' etymological details were the same as I'd gathered from other sources. Of the three 13th and 14th century examples of documentary evidence, I'd previously seen only one. The main Irish location for the name was given as Cork, which is easy enough to find from Griffith's Valuation when there were no incidences of the name outside the county. 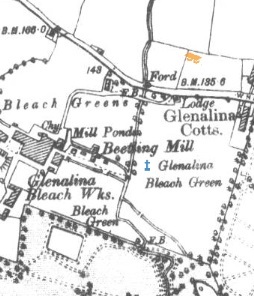 The main GB location for Santry in 1881 (as per the England and Wales census) was given as 67, with which FindMyPast agrees. The 'Current Frequencies' in BB were recorded as 177, which I've no reason to not accept. But when it came to 'Current Frequencies' for Ireland, the result was a big fat 0. I know a good few people, many of them still in County Cork, who might like to argue with that finding. I've no idea what sources were used to come up with this result. I have asked the question and been told it's been passed on to the Irish consultant. Presumably the source dates to the same period of history where there were 23,713 Doyles in Ireland and only 37 O'Driscolls (the frequency numbers for those names)...? I confess to being more than a little irritated that the Santry entry, as well as those for Tierney, Tobin, Crowley and Donovan, were accompanyied by a map of the name's distribution in Britain. There were no maps for Ireland. When you're dealing with dominant traditional Irish names, surely a distribution map of Ireland wouldn't have been too much to ask. If they didn't want to go to the bother themselves, they should have had a word with John Grenham. At £400 for the package of 4 volumes, this Dictionary is obviously intended for institutional use rather than for the shelves of the individual researcher. I'm sure it will become a popular and standard reference work but while I respect the work that's gone into it and the stamina of those involved, my enthusiasm is somewhat muted, at least for the Irish entries. Edited 13:35pm to include free access login details (thanks Joe Buggy @TownlandOrigin) and remove resulting redundancies. FindMyPast has added an unknown number of trade directories to its 'Ireland, 19th Century Directories' collection, totting up the number of volumes available to more than 120. Among the additions are believed to be The Treble Almanac (now spanning 1802–1844), Thom's Irish Almanac (now spanning 1844–1900) and Pettigrew & Oulton's Dublin Almanac and General Register of Ireland (now spanning 1834–1850). The Mayo Constitution has been added to the British Newspaper Archive (BNA), becoming the 128th Irish title in the online portfolio. In this initial upload, 740 editions of the Castlebar-published title have been made available, dating from 1852–1858 and 1864–1871. The holding will eventually span 1828 to 1872. By joining the BNA site, The Mayo Constitution is automatically added to FindMyPast's Irish Newspapers collection, which is available to researchers with an Ireland or World subscription package. A second tranche of videos of lectures presented at last month's Genetic Genealogy Ireland conference is now available for free viewing on the GGI YouTube channel. The Archives and Records Association, Ireland (ARAI) has launched its fourth annual Explore Your Archive week, a campaign to increase awareness of the essential role of archives in society. A focus of this year’s campaign will be the growing importance of online archiving and the digitisation of valuable collections. Explore Your Archive week is run jointly by ARAI and the UK's Archives and Records Association, and seeks to encourage people to discover the stories, facts, places and the people that are at the heart of Ireland’s communities. Archivists, record managers and conservators will host talks, workshops, exhibitions and tours of their unique collections from Saturday 19 November to Sunday 27 November. Organisations participating in Explore Your Archive include business, university, state, military and specialist archives, both north and south of the border. The National Archives of Ireland will host a talk (22 November 6pm) on the newly published Report of The Survey of Hospital Records in Ireland. The talk will draw together archivists and historians to discuss the current state of Irish medical archives. Dublin City Library and Archive together with Near FM will host a workshop to showcase the Near FM Archive, a digital audio archive with a particular emphasis on local arts, music, news, history, heritage and community events. The Archive has also generated the exhibition 'Dublin Remembers: Stories from the Somme’, focusing on personal stories of individual Irish men who fought at the Battle of the Somme, as well as seminars on popular theatre and on the First World War and the Somme with a range of expert speakers. The Royal College of Surgeons in Ireland will launch a unique ‘story box’ on the RCSI during 1916 and the death of RCSI graduate Charles Hachette during the fighting. The story box also discusses how archival material relating to Charles's life was discovered following a call-out via social media to try and locate any relatives who may be able to put a face to his name. 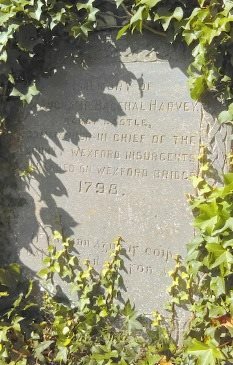 The files added to the volunteer-led Ireland Genealogy Projects Archives (IGP-web) in the first half of the month are dominated by photos and transcriptions of headstones, but if you've family connections to Co Louth, don't miss the Drogheda Rentals & Properties file contributed by Mary Heapy; it includes details of leases dating from the late 1600s to early 1800s. See the full list of linked topics on the PRONI's website. Looking at the list of this Centre's online sources, I think these latest additions mean that transcriptions for ALL marriages registered in County Sligo from 1864 to the 1920s are now searchable on the RootsIreland database.